For many years I have made a habit of carving out a few hours each week to sit by the water. With each passing year the restorative quality of these moments have intensified, and their cumulative impact on my life grows more significant. Solitude is, for me, a deep well of sustenance, and although it can be found in many places and many ways, it’s power by the water seems magnified. There in the quiet, and in the presence of such staggering natural beauty, a calmness invades my spirit that I sense at a deep level both physically and emotionally. No other environment comes close when I want and need to feel the presence of God, and it has been in the clarity of those moments that His most comforting, enlightening and compelling words to me have been experienced. Beside those “still waters”, my thinking, praying, reading and writing seem to reach, what is for me, the most unencumbered connection to the Lord I can find. Memories of such places and times are cherished, and my spirit is drawn back to these vistas by a thirst from deep inside. My appetite for this probably began when hunting as a young teen. The sense of peace that envelopes me when alone in the woods as the sun rises or sets is addictive, and undoubtedly, has set me on a path of feeling a wholeness of spirit in such stillness. Seems I’ve needed this ever since. It is amazing to me how my life and ministry for forty years has been anchored by such beautiful places…places like the salt marsh on Beals Island, a quiet bend in the Kennebecasis River, the view across to Ministers Face, the Catons Island sand bar, the Yacht club in Milledgeville, Long Reach, Pointe Du Chene, Centennial Park, or my current fav – the wild beauty of Mud Lake. 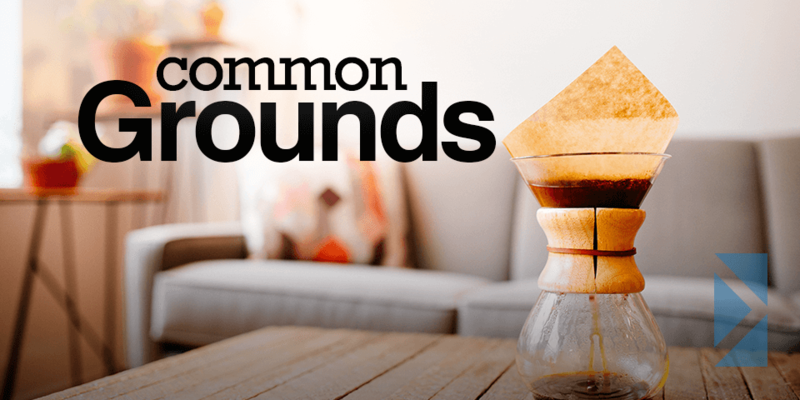 Every Sunday morning at 9am: “Hot Coffee, Breakfast & THE BOOK”! This is a great time of interactive discussion on varied questions about Bible topics, led by a variety of leaders. It includes breakfast (donation), great fellowship and some wonderful Bible discussion. Be sure to include this time of corporate Bible study in your schedule. Come and support the Pregnancy Care Centre in this year’s auction held at St. Francis Xavier Church Hall, 106 Church Ave. Items include antiques, furnishings, tools, plants, pickles, jams, jellies, baking, books, and more. Viewing starts at 9:30am. All men and their sons are invited to a great time of fellowship over breakfast at JJ’s Diner. 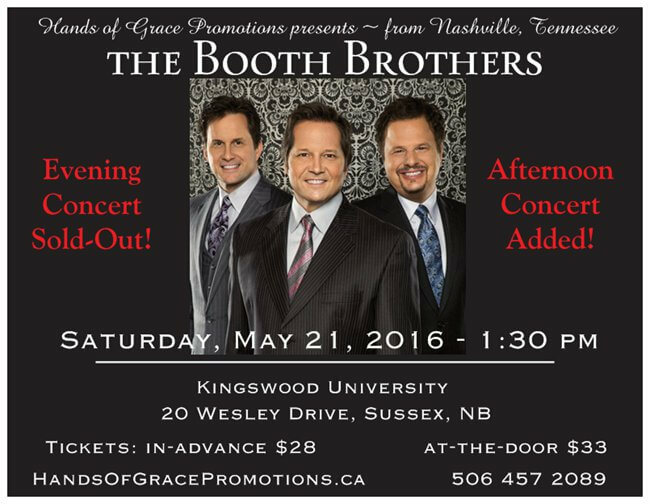 An inspiring blend of song, humour, and the Word makes a Booth Brothers concert an experience of a lifetime. 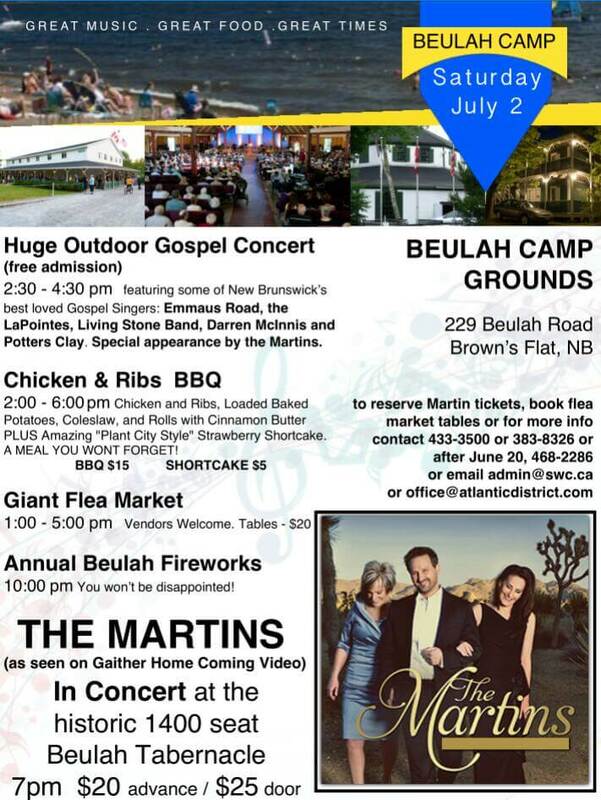 Plan to join us for their first-ever appearance in Atlantic Canada. SWC wants you to know….